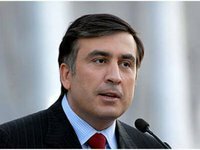 Former Georgian president and Movement of New Forces leader Mikheil Saakashvili is planning to continue his visits to Ukraine's regions to meet with activists. "I would like to announce that our visits throughout Ukraine and our meetings will continue. I'm planning to visit Lviv and several other cities next. I've learned my lesson, I will go everywhere with a [power] generator and candles and schedule a meeting at five places at the same time. And we will still reach people, because this is not going to work without that," he told reporters at Kyiv's Court of Appeal on Friday. Saakashvili held a meeting in Dnipro on January 15 and visited Odesa on January 18. There were difficulties at the politician's meeting with activists in Odesa. The meeting had originally been scheduled for the Black Sea Hotel, but the administration of the hotel canceled it, citing difficult weather conditions. The meeting was moved to the Gagarin Plaza Hotel, where a film about Ukraine and the changes Saakashvili has proposed was presented. The power went out during his speech, and later, there were issues with the sound. A supporter said that the power was turned off on demand of the Ukrainian Security Service (SBU).